With Cupertino-based Apple Inc, the once invincible iPhone maker, increasingly falling out of favor in the Chinese market, where local brand names, notably Huawei, are becoming extremely fashionable, it could be said that the tensions - on many occasions termed as a trade war - have reinforced a shift in Chinese public consumption esthetics toward homegrown tech products. Nevertheless, that's not to say the nation's pride in its technology is being blindly driven by a populist sentiment. Instead, it points to the colossal progress local companies have made over the recent years in narrowing the technological gap between China and developed countries, which inadvertently makes some feel nervous as well as lays the psychological groundwork for the Chinese people to proudly opt for indigenous brands. There are signs that headwinds, on multiple fronts, especially on the political side, that the Chinese telecoms firm is faced with, have driven the intrinsically motivated company into a greater commitment to research and development (R&D). As an indication of its commitment, Huawei took the wraps off its next-generation chipset for servers last week. The new chipset known as the Kunpeng 920 is named after a giant bird in Chinese mythology, apparently signaling the company's ambition to fly high in the global tech space. The chipset, based upon architecture from UK-headquartered ARM which is now owned by SoftBank, is envisioned to give a big boost to Huawei's cloud business, extending its strength beyond the sphere of telecommunications equipment and mobile devices. The latest addition to Huawei's 7-nanometer chip portfolio that also includes the Kirin 980 created for its smartphones and the Ascend 910 designed for artificial intelligence applications running in the cloud is expected to further enhance the company's capabilities in one of China's weak links in the tech world, namely chipmaking. 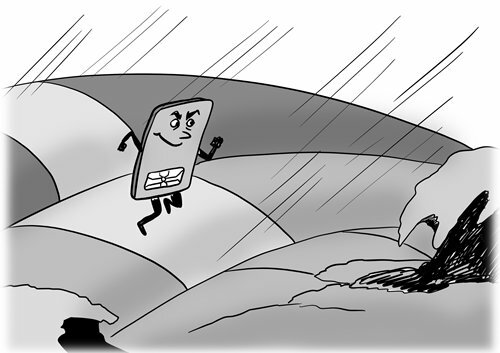 Other Chinese tech houses such as Beijing-based Xiaomi Corp have also in recent years ventured into making their own chips, as part of broader efforts to elevate homegrown brands into new tech trendsetters. Whatever headwinds there might be, a persistent pursuit of technological innovation ought to be the fundamental factor behind a sustainable success of any business. In a compelling example, while Apple is still immersed in identifying the culprits for its lackluster performance, its Chinese rivals are continuing to pile up their technological strengths and competitive advantages that have resulted in a consumer shift, in not only China, but many other markets, away from the likes of Apple and Samsung toward Chinese-branded phones and other devices. In a letter to investors earlier in January which surprisingly revised down the company's revenue guidance for its current December quarter, Apple CEO Tim Cook wrote "while we anticipated some challenges in key emerging markets, we did not foresee the magnitude of the economic deceleration, particularly in Greater China." Most of the company's revenue shortfall to its guidance, and more than 100 percent of its year-over-year global revenue decline, occurred in the Greater China region across iPhone, Mac and iPad, claimed the letter. It is true that the Chinese economy is slowing down and mobile phone shipments in the market that's hitting saturation are in decline. However, they alone do not justify Apple's poor performance. Statistics from Counterpoint Research showed that in the third quarter of last year, Huawei, Vivo, Oppo and Xiaomi were the top four phone vendors in the Chinese marketplace for smartphones, capturing a share of 23 percent, 21 percent, 21 percent, and 13 percent, respectively. Apple only earned fifth place in the ranking with a 9 percent share. The latest iPhone models are seeing massive price cuts by retailers across China, deepening woes over Apple's viability compared with its local competitors. Throughout the years, from the announcement of the iPhone 4 in June 2010 which established Apple's position as the most formidable premium phone vendor on the planet, to the current huge discounts its newest phone models are facing as buyers no longer believe they are worth the cost, Apple should have realized that the market has changed. The rise of Apple's Chinese rivals, most impressively Huawei, to the extent that it reverses an iPhone-centric smartphone fever, proves that the offerings of exciting features at reasonable prices can over time lead to a fundamental change. Therefore the prevailing motto: keep investing in R&D and always put innovation first.